Zlatan Ibrahimovic scored a hat-trick as Paris St-Germain warmed up for their Champions League tie with Manchester City with a comfortable win over Nice. Ibrahimovic put the French champions ahead from an awkward angle after David Luiz's pass before Hatem Ben Arfa equalised with a deflected effort. However, the Swede curled in a free-kick to restore the hosts' lead and Luiz headed in a third from a corner. 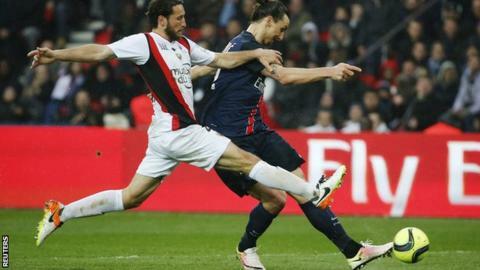 Ibrahimovic netted his third goal after being put through by Adrien Rabiot. It means the 34-year-old striker, who has been linked with a move to the Premier League in the summer, has now scored 30 goals in 26 Ligue 1 games this season. PSG - who clinched the Ligue 1 title in March with eight games to spare - are 25 points ahead of second-placed Monaco and are next in action on Wednesday when they take on Manchester City at home in the first leg of their Champions League quarter-final. Match ends, Paris Saint Germain 4, Nice 1. Second Half ends, Paris Saint Germain 4, Nice 1. Attempt saved. Hatem Ben Arfa (Nice) left footed shot from outside the box is saved in the bottom left corner. Assisted by Wallyson Mallmann. Substitution, Nice. Stéphan Raheriharimanana replaces Jean Michael Seri. Foul by Jean Michael Seri (Nice). Foul by Paul Baysse (Nice). Foul by Wallyson Mallmann (Nice). Corner, Nice. Conceded by David Luiz. Goal! Paris Saint Germain 4, Nice 1. Zlatan Ibrahimovic (Paris Saint Germain) left footed shot from the left side of the box to the centre of the goal. Assisted by Adrien Rabiot with a through ball. Wallyson Mallmann (Nice) wins a free kick in the attacking half. Substitution, Paris Saint Germain. Christopher Nkunku replaces Lucas Moura. Foul by Hatem Ben Arfa (Nice). Corner, Nice. Conceded by Thiago Silva. Attempt blocked. Hatem Ben Arfa (Nice) left footed shot from outside the box is blocked. Valère Germain (Nice) wins a free kick in the attacking half. Paul Baysse (Nice) wins a free kick in the defensive half. Substitution, Paris Saint Germain. Edinson Cavani replaces Hervin Ongenda. Substitution, Paris Saint Germain. Benjamin Stambouli replaces Thiago Motta. Hatem Ben Arfa (Nice) wins a free kick in the defensive half. Substitution, Nice. Franck Honorat replaces Alassane Pléa. Substitution, Nice. Wallyson Mallmann replaces Vincent Koziello.